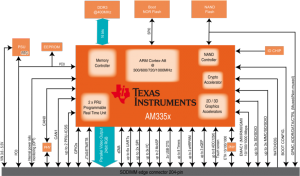 DIVA is a CPU module based on Texas Instruments "Sitara" AM335x Cortex-A8 application processor. 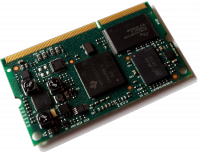 It is built with SO-DIMM 204 pin form factor and it offers lots of graphics, processing, peripherals and industrial interface options, allowing customer to implement cost-effective designs. The Programmable Real-Time Unit and Industrial Communication Subsystem (PRU-ICSS) adds further flexibility and enables additional peripherals interfaces and real-time protocols such us EtherCAT, PROFINET, EtherNet/IP, PROFIBUS, Ethernet Powerlink. DIVA is a family of system-on-modules that belongs to DAVE Embedded Systems Lite Line product class. Please visit DIVA Web Page for more product information. Please subscribe to the Diva Pages Updates RSS Feed using your favourite RSS reader to be notified on wiki pages updates related to Diva. This category collects all the pages specific to DIVA modules and related carrier boards. This page was last modified on 9 October 2018, at 09:32.